Home to almost 20,000 businesses; Bristol ranks second in the Start-up Cities Index 2017. Could the city bring you start-up success? Why should you start a business in Bristol? Pipped to the post by Edinburgh, Bristol has ranked second place in the Start-up Cities Index 2017 thanks to its skilled labour force, above average business survival rates, broadband speeds, and, most significantly, its burgeoning start-up community (2,795 start-ups launched in the capital in 2016). Serial entrepreneur Oli Barrett MBE has previous made a case for Bristol as being one of the best cities to start a business and, here at Startups.co.uk, we have to agree. Awarded the title of ‘European Green Capital for 2015’ by the European Commission, rather unsurprisingly Bristol has low road speeds at 15 miles per hour but boasts a good range of transport links. Bristol Airport is local as is the M32 and M5 motorways with London a 90 minute drive away or a 90 minute train journey via London Paddington. Bristol Council is in the process of providing a £400m boost to its transport infrastructure, including a £21m to improve vehicle, cycling and pedestrian access in the Temple Quarter Enterprise Zone and £200m for its citywide MetroBus – due for completion this year. It is also looking to make further inroads with its Smart City programme. Launched in 2011 as a collaboration between public sector and business, the programme is working on implementing several smart technologies such as smart metering, electric vehicles and open data. Aside from its green title, Bristol is known for being home to one of the UK’s busiest ports; Royal Portbury Docks. The Docks reaches over 42 million people and has become a central attraction for businesses looking to gain access to international markets. The port’s recent technological advancements have seen the rise of its commercial development Harbourside; a mixed-use retail site which offers office space and rental accommodation. Other areas in the city centre such as Queen Square, Lewins Mead and Clifton have also become increasingly popular with small businesses; particularly those in the media, IT, and public sector. The city is also home to one of the UK’s largest urban regeneration projects, Bristol Temple Quarter Enterprise Zone. Situated directly next to Bristol Temple Meads Railway Station in the centre of Bristol, the zone looks to “drive economic growth” and already has over 350 businesses on site since its launch in 2012, with a growing cluster of start-ups in the creative and digital sectors moving to the zone. In terms of retail opportunities, commercial space is available to lease at Cabot Circus – the new £500m retail project launched as part of the Bristol Shopping Quarter, alongside The Galleries and Broadmead. Cabot Circus occupies a 36 acre site and currently has over 120 stores with an alleged one million sq ft of shopping and leisure facilities. Bristol has two universities; the University of Bristol and the University of the West of England (UWE) which are both research-led. Ranked among the top 30 universities globally, the University of Bristol actively looks to collaborate with businesses in the local area and offers support to place graduates. The university runs the RED programme (Research and Enterprise Development) which works with entrepreneur communities and researchers inside and outside of Bristol providing a range of services including graduate placements. Accessible through its STEP initiative, a national scheme for short and medium-term work placements, the university can arrange both undergraduate and postgraduate placements to work on a specific business or technical project. In addition, a large proportion of Bristol’s labour force are well qualified – 47.9% of the working age population have NVQ Level 4 qualifications and above. The costs of gaining access to this talent are around average, having risen from £508 in 2015 to £526.80 in 2016. This is lower than university cities such as Cardiff (£531.40), but much higher than Nottingham (£448). The West of England Local Enterprise Partnership (LEP) is working to attract new businesses to the Bristol area and was awarded £86m to develop Bristol and the surrounding countryside and has partnerships with several local organisations which can offer business support. One of its central focuses is to generate private investment in the Temple Quarter Zone with its target to create 4,000 jobs by 2017, and around 17,000 jobs in the 25 year lifespan of the project. For businesses looking to move to the zone, the LEP offers discretionary business rate discounts of up to £275,000 on a yearly basis. Given that Bristol is home to the High Value Manufacturing Catapult Centre, one of seven government-backed programmes across the UK, the city has a strong emphasis on technology and science. It’s “innovation centre” Bristol and Bath Science Park (BBSP) offers lab space, hot-desks and a “grow-on centre” where fast-growth businesses can become residents in order to scale their company. High-tech start-ups are also supported by South West initiative SETsquared; a partnership between the Universities of Bristol, Bath, Exeter, Southampton and Surrey, which creates bespoke advice packages including mentoring and funding for early-stage firms from within and outside the universities. Additional advice is also available via BRAVE Enterprise, an independent not-for-profit organisation based in Bristol which provides training courses and workshops to start-up businesses. In January 2017, cloud firm Oracle announced it had chosen Bristol as the location of its tech accelerator HQ, supporting five cloud start-ups through the programme. For those looking for offices, there is an abundance of shared premises and co-working spaces across the city including the Engine Shed Enterprise Centre – part of SETsquared – which provides incubation space and co-working offices, alongside sites such as The Mild Bunch, Funky Spaces and not-for-profit Bristol Games Hub. Start-ups launching in, or moving to, Bristol have a range of funding options open to them starting with the West of England Growth Fund. The Fund, which provides grants of varying amounts between £10,000 to £80,000 to businesses and projects that will generate economic growth or job creation within Bristol and the surrounding area. For larger grant funding amounts, The West of England LEP is able to distribute grants from the government’s Regional Growth Fund, and has over £25m to invest into Bristol and the wider West of England. Between £10,000 and £1m is available to entrepreneurs looking to support research and development, training, capital investment, and recruitment of disabled or disadvantaged workers. As opposed to grants, there are several loan funds active in the Bristol area including the Microcredit Fund. Designed to support viable start-ups and established businesses, the Microcredit Fund has loans of up to £7,500 with a 6% fixed interest rate. Lower interest rates are available from SWIG Finance which has loans of up to £50,000 with a 1% amount payable on the funding drawn down. While it might be an attractive location for house buyers with average property prices of £272,114, crime levels in Bristol are high. For every 1,000 people there were 98.50 police recorded crimes in the year ending June 2015, rising from the 94 crimes per 1,000 people recorded in the year ending March 2014 and markedly higher than the 84.23 UK average. Looking past house prices and crime levels, Bristol City has a lot to offer on the entertainment and culture side what with its theatre, flagship museum M Shed, the Bristol Hippodrome which stages major West End and Broadway productions, and a host of independent cinemas including Horts and Watershed. The Bristol Arena is also currently under development which is expected to increase tourism to the area. 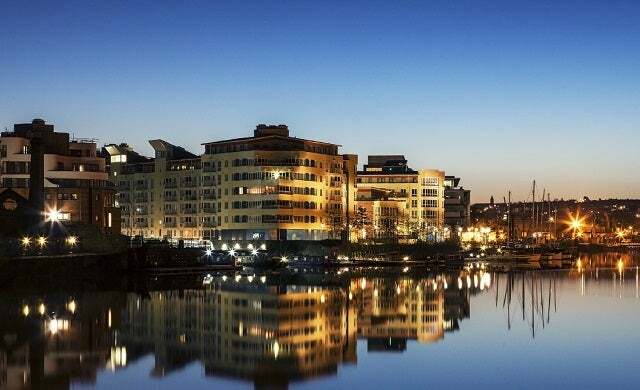 For nightlife and eating out, Bristol has an array of bars and restaurants including speakeasy-style bar Hyde & Co by the Triangle, The Grain Barge on Harbourside, as well as the Michelin-star restaurant Casamia, and new art venue-meets-steak restaurant Steak on the Art. A first-hand account from an early-stage start-up on what it’s like to start a business in Bristol and what the city has to offer new entrepreneurs. You can also gauge insider opinion on what more Bristol needs to do to accommodate start-ups.